Of all the chains I have seen it is probably not the grandest or most valuable but is by far the most unique of Mayoral chains, because it does not tell you who was the mayor in past years as chains often do, but rather tells a story, a pictorial story of the special City and the very special County we live in. It’s impossible to convey in words just how proud I am to be the Mayor of Hereford or describe the privilege I feel in wearing this chain. Words are inadequate, it has to be experienced, but proud I am. Next time you see it worn in public, take a closer look at it, but if you are interested read on and I will tell the story. The chain itself was gifted to the City in 1876 and originally consisted of 17 medallions, later a further 7 medallions were added, the most recent being that of the SAS regiment. The badge of office which is the large medallion at its centre was gifted by Edwin Edward Bosley J.P. who held the office of Mayor of Hereford in 1871-2, 1872-3- and 1873-4 and also in 1893-4. Let’s just dwell upon this a moment; the origin of the coat of arms dates back as far as 1189 to Richard the Lion Heart ,who gave us the right to use his shield for the City of Hereford. This was later augmented by Charles the 1st who gave the City it’s motto “ Invictae Fidelitatis Praemium “ which translates from Latin as The reward for faithfulness unconquered. This important episode in Hereford’s history relates to the siege of Hereford by the ten Scottish regiments aligned to the parliamentary army of Oliver Cromwell. This is only a small part of the rich history and heritage of Hereford, our historic Cathedral City. The Cathedral Chapter (The shield of the Dean and Chapter, presented by George Herbert M.A. Dean of Hereford 1867) our fantastic spiritual and historic centre, home of the Mappa Mundi, the chained Library, perhaps the finest example of the Magna Carta, all in our Cathedral, the most important destination for visitors to our City. The next medallion is Mistletoe (Presented in 1871 by John Lamb H.M. Coroner), a parasitic plant which grows so abundantly on fruit trees, of which we have abundance in Herefordshire. Mistletoe is recognised all over the world, particularly in Japan where it is worn by brides as a lucky charm, rather than in this country, to steal a kiss at Christmas time. The next one represents our one time excursion into heavy industry, A rolling Mill ( Presented by Henry Wiggin and Co. in 1971 to mark the Mayoralty of W.R.B.Griffin J.P. ) Henry Wiggin moved from Birmingham to Hereford in !958 and for which we saw a massive expansion of house building at Newton Farm and Tupsley to accommodate it’s growing workforce, at its prime employing some 6,000 people, later to be known as Special Metals and indeed pioneered powder metallurgy used extensively in the exploration of space, and space age industry. The next one is the emblem of a pear blossom (Presented by James Rankin J.P. in 1867) and represents the other widely made aperitif Perry also a very popular product from our orchards in Herefordshire. 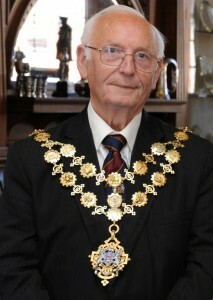 At the centre bottom of the chain and the medallion from which the badge of office hangs is the Monarch, our very own Queen Elizabeth (Presented by Mayor Albert Edward Farr 1952-3 and who was also Mayor 1953-4, to mark the Coronation year). Centre stage and representing our Civic and Historical heritage, the glue that binds us together as a nation. Following that is the emblem of an acorn (presented in 1863 by Evan Pateshull J.P. )representing the mighty oak tree and reminding us that once the county was abundantly covered with Oak forests, now only remains mighty specimens to remind us of their importance. The next medallion is a wheat sheaf (presented by Mayor John Gwynne James 1867), representing our other major industry, agriculture, the tilling of the land, and the rural nature of our County. The next medallion, Presented by Mayor Janet Ainsley in 1955, is the old house often referred to as the black and white house in our High Street , the most iconic representation of a bygone age of architecture that gives such interest to the millions of tourists that have visited our City over the years. Indeed the black and white trail as it is known is almost a pilgrimage to this bygone age and represents the industry that brings the most money into the county. Tourism is the greatest contributor to our economy, bringing in £510 million pounds in 2011, the last recorded year, by far the biggest contributor to our economy by a margin. The second row of medallions start with the emblem of the Royal Air Force (presented in 1959 to mark the granting of the freedom of the city of Hereford ), stationed at Credenhill for 54 years until the late 80’s when the station was closed, and gave way for it’s present occupation by our famous SAS regiment. The Hereford Bull ( presented in 1924 by Mayor W.G.C Britten in memory of Thomas Jefferson an ancestor and co-founder of the Hereford Breed ), that world famous white faced Hereford Cattle known all over the world is the most iconic symbol of Hereford and is featured on this next medallion. Centre point of the second row of the chain is that of the Lion which surmounts the coat of arms (presented in 1874 by Mayor Orlando Shellard )The Lion has long been associated with Hereford as it was Richard the 1st who granted Hereford its first Royal Charter in 1189 and the City Coat of Arms has at its centre the shield of Richard 1st . Hereford has always been loyal to the crown. Queen Elizabeth 1st awarded us so many privileges, most conspicuously our Cap of Maintenance and the title Right Worshipful Mayor ,one of only ten in the nation, and Hereford being the senior Right Worshipful, and King Charles whom we protected against Oliver Cromwell and for which he granted us our very special coat of arms. The next medallion bears the emblem of a salmon ( presented by the first woman to be elected Mayor of Hereford, Louise Luard in 1929 ), still a cherished catch on the wye, though not at all as abundant as it was in years gone by. If you would like a more detailed history of our traditions and artefacts we have some splendid booklets available. Please send a small donation for my Mayoral charity to cover postage and I will send them to you. Don’t forget to enclose your postal contact details. Tenant Farmers given notice in Herefordshire. IOC Councillors take up bus challenge.